One rainy, crappy winter's day, my Canadian colleague Navi came to visit, which meant we needed to find some decrepit building to screw around in. This old thing near the Russell Industrial Complex had been on my radar for a long time, but I had never been desperate enough to bother with it until now. It was a foggy, drizzly, miserable day and we had been walking for a minute, so I was anxious to get inside, even if the roof was collapsing. Inside we found timber beam construction, telling me that this building was at least 100 years old. There was no factory standing here on the c.1897 Sanborn map, only a house stood on this spot, but I also noticed that on the same page that a mere couple hundred yards away stood what looks to be the old "Milwaukee Junction" railroad station, in the middle of the junction between the Michigan Central, the Grand Trunk, and the Detroit, Grand Haven & Milwaukee Railroads—which is what gives this part of the city its name even to this day. On the c.1915 Sanborn map for the area this building is shown as being a bit larger back then, and it was owned by the American Can Company, which was incorporated in 1901 and was known for buying up many older can-making companies in cities across the nation in a very short period of time, and consolidating them under their own name. So it is possible that this building could have existed before 1901 as an independent can-making factory before it became American Can. For reference, the 1915 Sanborn map also shows J.W. Murray Mfg. Co. across the street, Detroit Wire Spring Co. nearby (makers of cushion springs, probably for automobile seats), as well as Hartwick Lumber Co., and Edgar's Sugar House No. 4. Upon further research, I found that when the American Can Co. was formed in 1901, it acquired the Detroit Can Co. at 1400 Trombly, and in 1909 it acquired the Kemi-Weld Can Co.—a subsidiary of Detroit Can, which was based in this building at the time. Kemi-Weld was known as one of the "principal manufacturers" of "fiber cans" back then, and the Detroit Can Co. was making metal paint and varnish cans. The Clark Can Co. was another Detroit firm mentioned as having been rolled into American Can in 1901. The New York City-based American Can Co. was also part of what was called the "Tin Can Trust," which resulted in the company being hauled into federal court in 1913. At the time of the anti-trust suit, American Can Co. still operated both plants in Detroit. The federal government accused them of having formed as a deliberate monopoly to control the market in 1901, and of using their subsidiaries to restrain interstate and foreign trade to their benefit. Clifford C. Boone, local manager of American Can's two Detroit plants went on record in the Detroit Free Press as calling the charges "absurd," saying that the feds need only listen to their customers, instead of just their competitors to see that they have not acted unfairly. But it seemed that the company did not have any real competitors left; by 1917 American Can had bought up so many smaller companies that they ranked 31st-largest of the top 500 U.S. companies, while their biggest competitor ranked a distant 222nd. Their factory in Cincinnati was even designed by Detroit architect Albert Kahn. According to ohiohistorycentral.org, American Can was known for inventing a can crimping method that eliminated the need for solder at the tops and bottoms of cans—which also eliminated the suspected presence of poisonous lead in canned foods. They also developed a coating for the inside of the can that eliminated food discoloration. In other words they invented the modern canned food container that we take for granted today. Among their other inventions were a "double tight friction cover for paint cans that prevented hardening of left-over paint and perfecting the process for vacuum-packing coffee," both of which are also taken for granted today. Again, this building existed before American Can took it over in the 1900s. The Detroit Can Co. was founded in 1890 according to an article in the Free Press that May, describing "a crying necessity" for a local source of paint cans at the time. Prior to that all of Detroit's paint cans were purchased from suppliers in Chicago and Toledo. Another article from 1899 said that the Detroit Can Co. plant was erecting a new factory in a new industrial sector of the city's northeast side (apparently this was the one at 1400 Trombly, according to the map provided). The property at 1400 Trombly was purchased from Hannan Real Estate Exchange, the same from whom they bought a property on Monroe Street back in 1892 and quickly outgrew. There were at least three paint and varnish manufacturers located in the Milwaukee Junction area in the 1890s as well, including the Acme White Lead & Color Works—which was just across St. Aubin Street (the city limits at the time) from this building—so it would make sense for a can company to locate themselves nearby. It would seem that this building was taken over as early as 1923 by J.W. Murray Mfg., later known as the Murray Body Co., which once occupied the giant buildings nearby that now make up the Russell Industrial Complex. 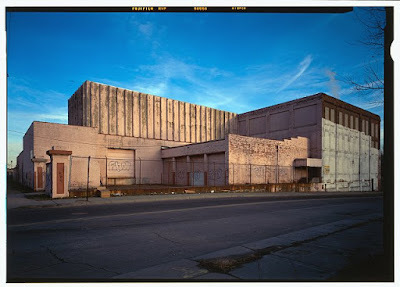 A writeup on the history of the Russell Industrial Complex / Murray Body Plant says that this building here at 1975 Clay was in fact the original plant of J.W. Murray Mfg. Co., in 1913, until 1916 when they built their massive complex at 1600 Clay, but info at coachbuilt.com seems to point to a different building on this block. 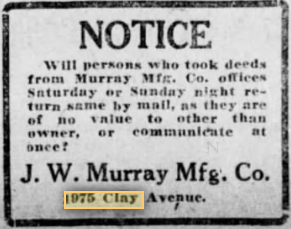 Nonetheless, Murray Body did in fact originate in this immediate area, and was founded by John W. Murray, a former director of Michigan Stamping Co.
Perhaps it is no coincidence that numerous different companies working in metal stamping would be located in the same sector of the city. Murray Body became one of the major car body makers along with Fisher Body, Briggs, and Budd, during the era of consolidation when the Detroit automobile industry transitioned from the old days of numerous small carriage-building shops to mass production and giant corporate mega-factories. In the 1920s when Murray moved into this plant, they were stamping body panels for Ford, Chrysler, Hupmobile, Marmon, Jewett, Willys-Knight, Reo, Dodge, Studebaker, Erskine, Durant, Paige-Detroit, and Peerless. They later also did stamping for Packard, Hudson, Lincoln, Mercury, Pierce-Arrow, Auburn, Crosley, International-Harvester, Plymouth, and Graham. By volume, the vast majority of Murray's body work was done for Ford Motor Co. It was also during the early 1920s that Murray collaborated with the famed custom coachbuilder Raymond H. Dietrich to produce his exclusive designs for Lincoln, as a personal favor to Edsel Ford. This plant was the scene of a "daring robbery" perpetrated by four "desperadoes" in May of 1924, where the paymaster of J.W. Murray Mfg. Co. was held up while unloading cash from an armored car. After taking the guard's gun and up to $20,000, the bandits sped off with a laugh. The money was all in envelopes ready to be doled out to the plant employees. A classified in the July 1959 Free Press hints that the facility had recently been used as a production paint plant, and its equipment was currently being liquidated as if it was shutting down. The building was listed as some sort of a warehouse in 1967, and 10,000sq.-ft. of it was advertised for lease in 1970 (probably the entire second floor). Back to that rusty sign on the side of the building in the second photograph. According to their company website, the G.N. DePerro Co. is "a full service electrical manufacturer's representative agency based in Metro Detroit." They produced items for the residential, commercial, industrial and OEM electrical equipment markets in Michigan since the late 1950s, which seems to dovetail in nicely with the previously mentioned paint company vacating this building right around that time. A July 1969 obituary for Howard E. Mahaffey however seems to indicate that the H.E. Mahaffey Co. may have also been located at this address in 1959...after resigning as a manager for the Westinghouse Electric Co. in Lansing, Mr. Mahaffey founded his own company that year, and at the time of the obituary it was located in this building. It doesn't seem like two competing electrical manufacturing companies would occupy the same building side by side, so—as in the case of Murray Body and American Can—there is probably more to this part of the story. Either way, the electrical manufacturing work being done in this plant would undoubtedly still have involved metal stamping, the same as it did for over 100 years prior. According to the Free Press archives on Newspapers.com, American Can was based at 901 Antietam Street in the early 1970s, and seemed to be desperate for journeyman electricians judging by the volume of want-ads I saw popping up in my search. American Can eventually renamed itself Primerica in 1987, and by that point was merely a financial conglomerate, having nothing to do with making cans anymore. It eventually became part of Citigroup.